Track the storm with WTOP. Find the latest forecast and traffic conditions and much more as what is slated to be the blizzard of 2016 grips the region. WASHINGTON — The D.C. area has largely shut down as a massive storm that threatens to bring extended power outages and extensive travel disruptions swept into the region and quickly dropped several inches of snow. The historic storm is expected to last a whopping 36 hours and could reach blizzard conditions. Officials in the District, Maryland and Virginia have been unequivocal: This is a life-threatening storm. 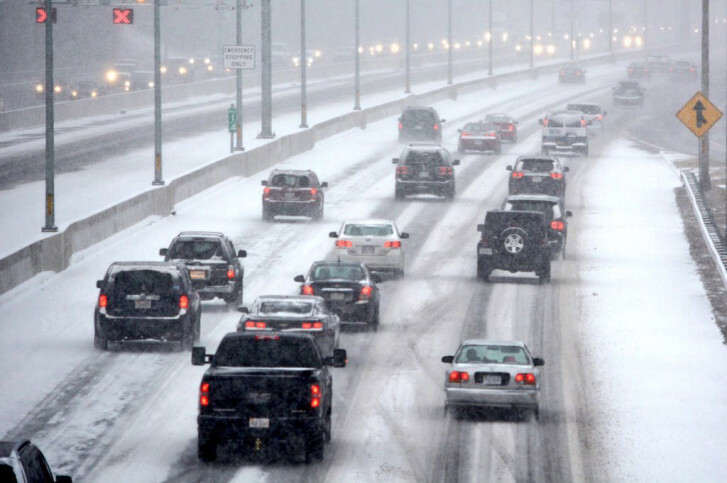 Friday, D.C. and Virginia officials urged residents and visitors to head home as road conditions quickly deteriorated. “This is a dangerous storm. There are way too many people out on the roads now and we need to make sure folks are getting where they need to be,” said Christopher Geldart, the director of the District’s Homeland Security and Emergency Management Agency during an afternoon briefing. By 8 p.m. the storm had dropped at 3 to 6 inches in communities across the region. Mayor Muriel Bowser said the snow coming down was wet and heavy, increasing the likelihood it come pull down tree limbs and power lines. She said that forecast predicting the duration of the storm and intensity are holding true so far and she urged residents to find some place safe, and to stay there. The storm could dump as much as to 30 inches of snow by Sunday morning. In the run up to epic pounding of snow, schools were closed, federal employees were sent home early and major sporting and concert events were canceled. A Starbucks in Northwest D.C. closed at 2 p.m. Lines at the Columbia Heights Target stretched through the store as shoppers grabbed last-minute supplies. Even Metro will close during the worst of the storm. By evening, D.C. streets were relatively quiet with few cars but plenty of pedestrians. Some bars and restaurants were still open and busy. Interstate traffic was relatively light and few accidents were reported — a dramatic contrast to Wednesday night when an inch of snow quickly turned to ice and battered commuters with slide-offs, spinouts and wrecks. Friday, the snow began in the predawn hours in Southwestern Virginia; as of noon, snow had begun to fall in Richmond and Charlottesville. And by 1:30 p.m., flakes were flying in D.C. As of 4:20 p.m., snow had overtaken the Mid-Atlantic from Richmond to Baltimore and beyond. The heaviest snow with strengthening winds (i.e. the most dangerous travel conditions) will come after midnight through lunchtime Saturday. Stay with WTOP for updates throughout the weekend storm. Blizzard Warnings from the National Weather Service took effect Friday afternoon and will last into early Sunday morning for the entire D.C. region. Heavy bands of snow pushed into the immediate Metro around dinnertime. But the heaviest snow will come overnight when the snow will fall at a rate of 1 to 3 inches per hour, said Storm Team 4 meteorologist Steve Prinzivalli. “The snowfall rates will be impressive. And we’ll see some and hear some thundersnow, which is just an indication of the strength of this low pressure center developing off the coast of North Carolina. Powerful storm that’s going to dump an incredible amount of snow,” he said. Wind speeds will range from 20 mph to 40 mph, gusting up to 50 mph. That will create blowing snow and low visibility and the chance for power outages. Temperatures overnight will be in the 20s but with windchills it will feel like zero degrees outside, he said. The heaviest snow will continue Saturday during the first of the day and will diminish Saturday night. The snow will push to the Northeast by Sunday morning and will taper to a few snow flurries before dawn, Prinzivalli said. Travel will rapidly become difficult or impossible Friday evening, with most roads totally impassable Saturday. Expect major disruptions of travel to continue Sunday, Monday and possibly Tuesday. Along with the snow, wind gusts will reach 50 mph, causing intense blowing and drifting of snow that will reduce visibility to near zero at times. Power outages could be widespread, and the heavy snow and high winds could prevent crews from any repair work until Sunday. By Saturday morning, a foot of snow is expected with more arriving throughout the day. A total of 20 inches to 30 inches of snow could be on the ground regionwide by the time the snow moves out of the area early Sunday morning except for Southern Maryland, which will also see sleet mix with the snow, holding down snow totals there. The powerful storm is expected to impact the eastern third of the country and roughly 50 million people. It threatened to bring tornadoes in Texas and ice storms in Kentucky and North Carolina. Coastal flooding is a threat in New Jersey. School districts around the region have canceled activities scheduled through the weekend. The Office of Personnel Management (OPM) has announced the federal government offices will close at noon on Friday. Employees have the option for unscheduled leave or telework. Those who do report to their worksites are advised to leave 4 hours earlier than their normal departure time, but no later than noon — which is when federal offices in the D.C. area will close. Read additional details from OPM by clicking here. Many college and professional sporting events in the area have been moved or rescheduled. See the list here. The Smithsonian closed D.C. museums, as well as the National Zoo, at noon, except for the National Museum of American Art and the National Portrait Gallery, which didn’t open at all. The National Park Service says the National Mall and Memorial Parks are closed through at least Sunday. The U.S. Postal Service closed all post offices in the D.C. metro by 3 p.m. Friday. Mail had to be in collection boxes by noon. The Rev. Paul Loverde, the bishop of Arlington, said in a statement Thursday that Catholics in the diocese aren’t obligated to attend Mass on Sunday. The archdioceses of Washington, Baltimore and Wilmington, Delaware, are reminding worshippers that dangerous travel conditions are a legitimate excuse from fulfilling their Sunday Mass obligation, The Associated Press reports. Find a full list of closings and delays here. Virginia Gov. Terry McAuliffe, Maryland Gov. Larry Hogan and D.C. Mayor Muriel Bowser have all declared states of emergency. Bowser has also declared a snow emergency. Metropolitan Police Chief Cathy Lanier says that if motorists are involved in a minor accident with no injuries during the storm, they should just exchange information and not call police for assistance. Lanier says that police will respond to emergencies throughout the duration of the storm, however should expect to wait longer for help. Learn more about the District’s public safety plans for the weekend here. Road conditions are deteriorating quickly in D.C. and interstates in Virginia are snow covered. Officials in both communities are urging drivers to stay off the roads and head home quickly. 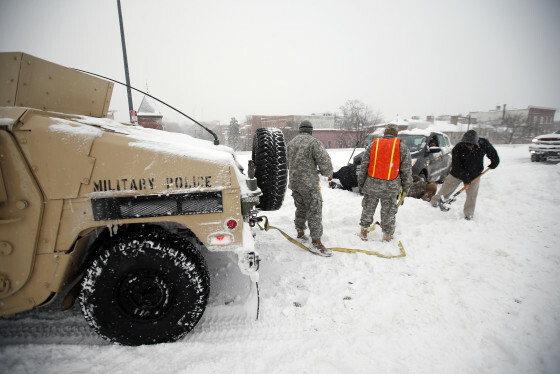 D.C. has already begun plowing city road, said, Christopher Geldart, director of the District’s Homeland Security and Emergency Management Agency. “We treated 100 percent of our roads before this storm came in,” he said. However those efforts were quickly overtaken by the heavy falling snow. Officials with the Virginia Department of Transportation are also urging motorists to stay home. American, United and Southwest Airlines have canceled all flights into the D.C. area’s three major airports — Reagan National, Baltimore-Washington and Dulles International — beginning Friday afternoon and continuing through Sunday morning, depending on the weather. Other airlines have announced changes as well. Metrobus and DC Circulator have both suspended service. Metrorail and other area public transit agencies are also making changes in the face of the storm. Metrorail was single-tracking on Friday in certain spots in order to allow room for trains to be parked in the tunnels to protect them from the snow. Find out more about the transit situation here. Metro will keep its Park-and-Ride lots open Friday night for drivers looking for a place to park. Also, Metro is allowing drivers to leave cars parked overnight in Metro garages and lots, which are always free on weekend. The free overnight parking ends Monday morning. Car2Go, the car-sharing service, suspended service as of Thursday night. The D.C. Taxicab Commission has enacted a Snow Emergency Fare as of 9:30 a.m. Friday. The fare authorizes taxis to add a flat fee of $15 to the metered charge. They ask customers not to return bikes to those stations. Get the latest traffic updates on the WTOP traffic page, by following @WTOPTraffic on Twitter and by listening to 103.5 FM on-air or online. You can also follow along with the latest traffic conditions, in our live blog. Utility companies are warning customers to brace for outages — some of which could last for multiple days. They’re giving the same advice they give at the beginning of every storm: Don’t assume they know your power is out — report it. Find phone numbers and links to report an outage over the phone or online, as well as what else the power companies are doing to prepare for the storm, here. Or text the word POWER to 91035 and WTOP will text the number back to you. Is there a bright side? Well, for those who can make it to Capitol Hill, you can sled down it legally now. Listen live on WTOP.com, on the WTOP app or tune in to 103.5 FM.